Larry D. Turner was sworn in as the Deputy Inspector General of the U.S. Department of Labor and as a member of the Senior Executive Service on September 8, 2014. 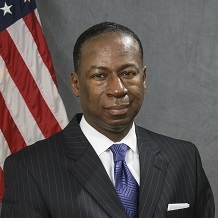 As Deputy of the Office of Inspector General, Mr. Turner shares the responsibility for overseeing the administration of a nationwide, independent program of audits and investigations, involving Department of Labor programs and operations, such as Job Corps, employee benefit plans, and by combatting the influence of organized crime and labor racketeering corruption in the workplace. Prior to this appointment, Mr. Turner served as Deputy and Acting Assistant Inspector General for the Office of Communication and Congressional Liaison, Department of Defense, and the Deputy Inspector General for the Army Installation Management Command (IMCOM). Before joining the IG community, Mr. Turner served as Army Installation Management Command Liaison Officer to the Army Materiel Command, and Executive Officer to the Executive Director, IMCOM. Mr. Turner served 24 years in the U.S. Army and retired as a Lieutenant Colonel. Mr. Turner holds a BS Degree in Business from Morgan State University, an MBA in Business Management from Golden Gate University, and an MS Degree in Resource Management from the Industrial College of the Armed Forces (ICAF). He is a graduate of the Command and General Staff College; the Harvard University Senior Executive Fellow Program; and the Federal Executive Institute. Mr. Turner holds a Certificate in Financial Planning from Georgetown University. Mr. Turner has received numerous civilian and military awards to include: DoD and Army Civilian Meritorious Service Awards, Civilian Superior Service Award, Civilian Commander's Award, Legion of Merit, and Meritorious Service Medal with Five Oak Leaf Clusters, multiple Southwest Asia Medals, and the Army Parachutist Badge.